Recognizing that the healthcare system too often fails those who need it the most, the Peterson Center on Healthcare has been working to improve the quality and lower the cost of care for high-need patients since 2015. The work began with an 18-month partnership with the Harvard T.H. Chan School of Public Health, the National Academy of Medicine, and the Bipartisan Policy Center to better understand who comprises the high-need population, match evidence-based care delivery models to specific segments of high-need individuals, and identify policy constructs to support their scale at a national level. In 2016, the Center joined The Commonwealth Fund, The John A. Hartford Foundation, the Robert Wood Johnson Foundation and The SCAN Foundation in a collaborative to maximize their individual investments and avoid duplication in efforts to scale and spread promising care models for high-need individuals across organizations participating in value-based reimbursement. Together, the Five Foundations commissioned the Institute for Healthcare Improvement to develop the Better Care Playbook to offer key stakeholders resources for identifying people with complex needs, implementing promising approaches, building a business case, and more. The Center continues to invest in new partnerships. We have started new initiatives with Brown University and Stanford University’s Clinical Excellence Research Center to identify high-performing practice characteristics that can be replicated in the field. Over the last decade, the fact that a small portion of the population—around 5 percent—accounts for almost half of healthcare spending nationwide has focused attention and resources in the field to find ways to improve care for these high-need individuals. This effort has yielded greater knowledge about who comprises this population, and what type of care can meet their complex needs. An emerging body of work in the field is exploring new opportunities to spread promising interventions that can improve the quality of care and lower spending for this particularly vulnerable population. How can we build on that foundational experimentation and research to transform how care is delivered nationwide? Success depends on finding the right approach for each patient and adapting the care plan to their needs and goals. 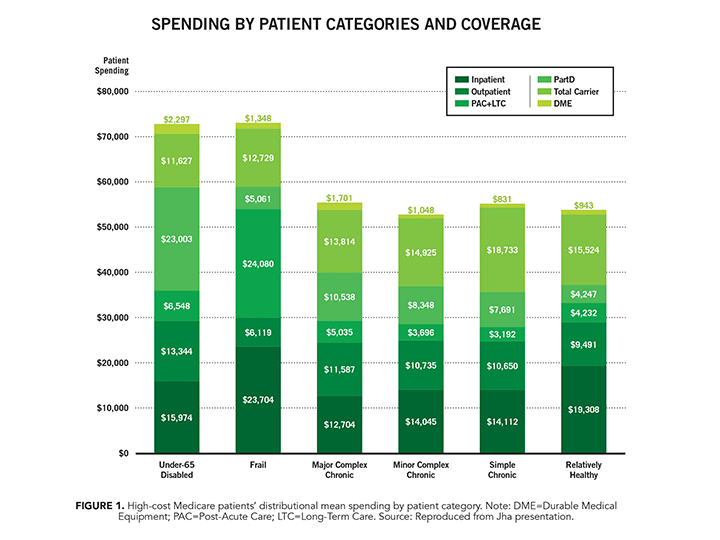 The research is clear: the high spending with high-need patients has more to do with the inefficiency and ineffectiveness of our healthcare delivery than it does with the patients themselves. Improving outcomes for this population means revamping care systems, matching care to complex needs, and better supporting patients and their caregivers. Promising models of better care for high-need patients exist, but we need to advance the field's knowledge of how to implement those models. Through the Center’s partnerships and grant-making, we have identified common characteristics of high-performance care, those that both improve health outcomes and create system efficiencies. But knowing what works in one place isn't enough. We want providers to be able to replicate that care everywhere. This means making implementing what works easier, under the highly variable conditions where our patients interact with the healthcare system. Addressing these challenges requires a collaborative approach. We convened the Center’s grantees to look past the conventional wisdom that defines this group solely based on costs, to truly explore this population’s complex issues—including multiple chronic conditions, behavioral health challenges, functional limitations, and unmet social service needs. We've also joined forces with The Commonwealth Fund, The John A. Hartford Foundation, the Robert Wood Johnson Foundation, and The SCAN Foundation to take a more strategic and coordinated approach to scaling the most promising models of care. My own experience is that caring for high-need patients is demanding and sometimes frustrating as a provider and as a caregiver. My own in-laws wandered through a maze of care settings and providers as their medical problems mounted, never quite sure what was around the next corner. Despite the fact that my wife and I are both primary care physicians, and that we knew her parents' doctors personally, the complexity of their problems overwhelmed the system. It defeated what we knew was good intent from their doctors and other professionals, and we failed them in the end. We failed them not because they died, but because we couldn't help them through their time of medical complexity in the humane way that we would each want for ourselves. We can and must do better. The work ahead must continue to build from the foundation that has been set by researchers and innovative providers. If done well, it will shorten the path from identifying better healthcare to delivering better healthcare for those patients who need it most. While various interventions and pilots have attempted to address complex care for high-need patients, these programs often assume everyone in this population can benefit equally. Analyses of claims data for Medicare-only and dually eligible Medicare-Medicaid patients, such as those done by researchers at Harvard T.H. Chan School of Public Health, are opening our eyes to the true heterogeneity of the individuals that comprise the high-need population. Harvard's team characterized high-need individuals in the highest ten percent of spending by clinically meaningful and potentially actionable segments: the non-elderly disabled, the frail elderly, those with major complex chronic conditions, those with minor complex chronic conditions, those with simple chronic conditions, and the relatively healthy. More granular analysis of patient characteristics, sociodemographic data, and preventable spending by care setting between high-cost and low-cost subgroups revealed where interventions can potentially improve quality outcomes and lower costs among the segments. For example, Harvard's research shows that, across all identified segments, high-cost dually eligible patients have higher overall spending than high-cost Medicare-only beneficiaries. This spending, according to Harvard's analysis, is predominantly driven by medications and utilization of post-acute care. These same patients also are more likely to have a higher share of preventable inpatient admissions and emergency department visits, suggesting multiple opportunities to invest for impact are emerging. Whether certain individuals remain high-need from year to year or have intermittent episodes of highly intensive and costly care can also provide clues for better care delivery. For instance, dually eligible patients in Harvard's analysis who were high-cost over three consecutive years were more likely to use long-term services and supports as well as undergo more tests and procedures. Meanwhile, dually eligible patients whose spending fluctuated between high-cost and low-cost across three years were more likely to utilize expensive acute care. This segmentation research, supported by the Peterson Center on Healthcare, underpins key learnings in a special publication from the National Academy of Medicine and can inform more tailored approaches to care delivery. The following section highlights three key segments where characteristics have been defined and promising approaches to care have been identified. Future work can then explore how these models can be replicated, and adopted nationwide to create an efficient system for improving care, and reducing wasted resources. This population is defined as those under 65 years with end-stage renal disease or a disability based on Supplemental Security Income eligibility. Dually eligible beneficiaries in this category may have an intellectual disability, serious mental illness, or be physically disabled but otherwise healthy. Overall, this group spends the most on Medicare Part D medication. Successful interventions include multidisciplinary care teams and the coordination of clinical services, behavioral health and social services. One Care, a program created by Commonwealth Care Alliance, targets dually eligible individuals under 65. The intervention includes an emphasis on multidisciplinary care teams, individualized care plans, behavioral health integration, and enhanced care team availability. Commonwealth Care Alliance describes one study which found that after 12 months of enrollment, a subset of One Care enrollees had 7.5 percent fewer hospital admissions and 6.4 percent fewer emergency room visits. The Homeless Patient Aligned Care Team (H-PACT) targets homeless, non-elderly veterans regularly coming to the emergency department with medical and social needs. The intervention includes multidisciplinary care teams and emphasizes mental health and social worker staff to develop individual care plans that address housing needs. Since the program launched in 2015, emergency department use and hospitalizations decreased by 25 percent. Sarah is a 26-year-old woman who was recently involved in a car accident that left her paralyzed from the waist down. She was having a lot of trouble not only adjusting to her new reality, but also navigating all of her new healthcare needs. Sarah had been a regular runner before the accident, and she had always been in good health, so she was largely unfamiliar with the ins and outs of doctors’ offices. She turned to Nora for advice because it seemed as if this family friend was always either coming from or going to one doctor or another. Nora was in her mid-sixties and had been living with diabetes and heart disease for almost 20 years. Nora talked about how her nutritionist had helped her manage her diet, and how helpful she found her general practitioner. Sarah was really hoping Nora would be able to help her understand how to navigate appointments with specialists and to recommend a way to get mental healthcare that wasn’t readily covered by insurance. Even though Nora had tried to help, Sarah left their conversation feeling more confused. It was apparent that even though she and Nora each had a severe illness, their healthcare needs were incredibly different. This population is defined as over 65 years with two or more of the following frailty indicators: gait abnormality, malnutrition, failure to thrive, cachexia, debility, difficulty walking, history of falls, muscle wasting, muscle weakness, decubitus ulcer, senility, or durable medical equipment use. Frailty is one of the highest indicators that a patient will require high-cost care that could otherwise be avoided. Overall, this group spends the most on post-acute and long-term care, with Part D spending representing only a small portion of the frail elderly’s total spending. Interventions for this segment often emphasize shared decision-making and focus on reducing hospitalizations. The MedStar Medical House Call program in Washington, DC focuses on elderly frail or disabled patients at high risk of needing hospital, emergency department, or nursing home care. The intervention supports home-based primary care and emphasizes shared decision-making. MedStar reduced Medicare spending by 30 percent for this population within the first year of the program. The PACE program targets frail elderly, dually-eligible individuals with functional and/or cognitive impairments. The program supports independent senior living and includes comprehensive services such as primary care, long-term supports, and transportation. The reimbursement model utilizes per-capita fees rather than a fee-for-service system. Raphael was glad that emergency surgery to fix a pulmonary embolism in his 80-year old mother, Gloria, had gone so well. But he was unsure of what to do afterward. Gloria had steadily advancing dementia, and she wouldn’t be able to take care of herself after surgery, which meant that wound care and other recovery duties would fall on Raphael and his wife, Maria. When Gloria first returned home, Raphael and Maria struggled. Neither had any medical background beyond Maria’s CPR training, and they weren’t sure how to tell if Gloria’s surgery site was healing correctly. Their insurance offered to pay for a visiting home nurse, however, who came twice a day to change Gloria’s bandages and to check on her. When Gloria began to show signs of infection, the nurse recognized it before Raphael even knew something was wrong, and she was able to have it treated quickly. She also taught them about community resources—which their insurance would cover—that would help them manage Gloria’s dementia symptoms. Raphael was incredibly thankful for the care his mom received that he would not have otherwise been able to provide himself. 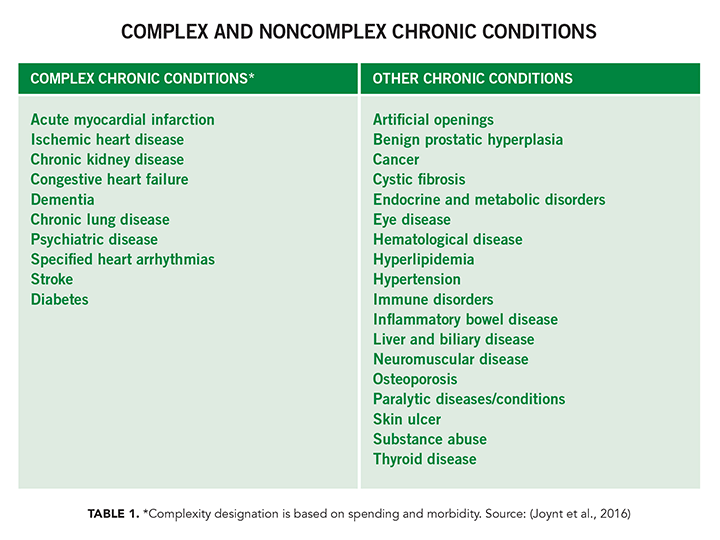 This population is defined as having two or more complex conditions or at least six noncomplex conditions from the table below. Medicare beneficiaries with more than three chronic conditions incurred almost three-quarters of Medicare costs in 2010 despite accounting for only 37 percent of the beneficiary population. Nearly 90 percent of the dually eligible population has multiple chronic conditions. 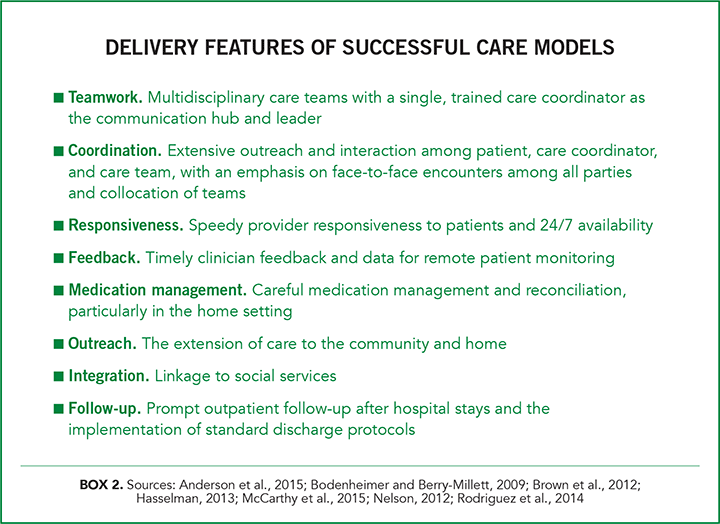 Interventions for this segment often include coordinated care transitions and home-based care. The Health Quality Partners model, Advanced Preventive Care, is centered around care coordination, disease management, and personalized preventive interventions. Community-based nurse care managers build supportive relationships with patients to encourage disease self-management and help patients avoid complications and improve their quality of life. A Medicare Coordinated Care Demonstration found that this program reduced all-cause mortality by 34 percent within two years. The Geriatric Resources for the Assessment and Care of Elders (GRACE) program targets low-income seniors with multiple chronic conditions. Led by an interdisciplinary support team, the intervention includes individualized home-based care combined with patient engagement tools. The GRACE support team acts as a bridge between the patient and his or her primary care provider, providing ongoing care management and coordination of care. Evaluations of the program have shown GRACE enrollees to have reduced hospitalizations, reduced costs of care, and increased patient satisfaction as compared to usual care. Mark is a 54-year-old man with rheumatoid arthritis and chronic heart disease. Many days he was reliant on a wheelchair to get around because of chronic pain. His job didn’t allow him to telework, yet it was difficult to get to the handicap entrance in the back of the building and his schedule was firmly fixed at 9 to 5. As a result, Mark spent more than an hour a day commuting in his car (public transportation wasn’t readily available). Everyday tasks like running errands and getting groceries were difficult. Between his pain and his heavy work schedule, he was left with little time to visit with friends and family, and it had left him feeling incredibly isolated and alone. Mark really missed having a pet; he had to give his cat, Felix, away because he could no longer take care of him properly. Mark felt he wouldn’t mind his disease so much if it didn’t impact his life and relationships so heavily. Understanding these patterns of care will help the Center and other organizations design, replicate and scale delivery innovations that provide the greatest improvements in outcomes and reductions in spending. 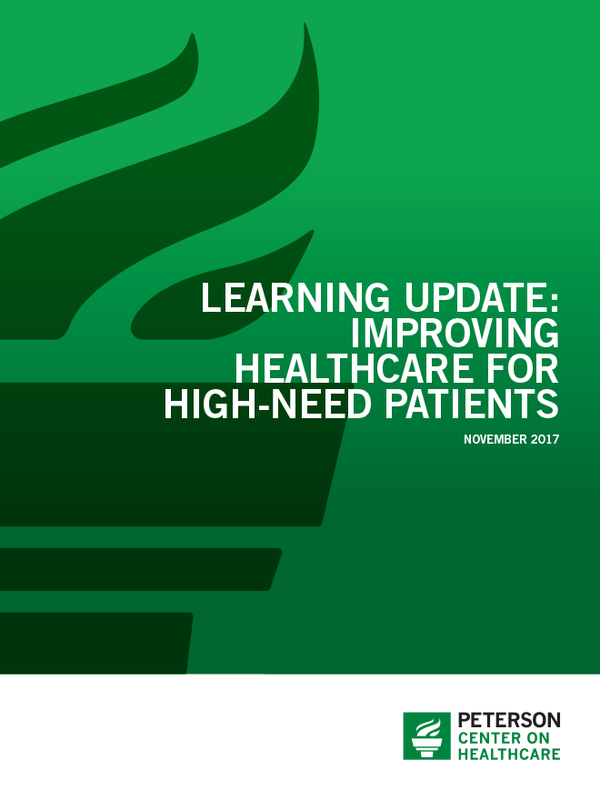 Although this analysis adds a great deal to our understanding of who high-need individuals are and what level of care they need, more work is needed to understand which components of care, and in which setting, have the greatest potential to reliably improve quality and lower costs for this population. There are also research opportunities to identify which high-need patients are even amenable to interventions. For example, across segments, some patients will consistently need high-intensity, high-cost care and are unable to return to a lower-cost primary care setting. It is important to note that this is only one approach to segmentation and should be recognized as a starting point from which organizations can begin to match care models with patients who might benefit most. For example, other approaches may address exposure to trauma and social determinants of health. Health systems and payer organizations, which have access to masses of data, can add to our common knowledge and bridge the gap between research and implementation. Despite their heterogeneity, successful high-need patient interventions and care models share common features. The sum of these features can be described simply: the right provider team delivering the right care for the right patient, employing the right data. Beyond the necessary medical considerations, building successful interventions often requires additional services that address social determinants of health, behavioral health, and substance abuse issues. Defining success within these buckets can involve developing and monitoring outcomes with ongoing input from patients and communities. Coordinating these services and implementing the delivery features above can be daunting without the proper tools. These tools include payment models that reward value over volume, technology with advanced interoperability, and healthcare workforce training that allows providers to practice at the top of their license and emphasizes coordination between colleagues. Synchronizing these policies—at the federal, state, organizational, and payer levels—with successful practice models is also critical for expanding these approaches. Together, these approaches can help reduce implementation barriers, develop financially sustainable systems, and scale up these interventions from pilot programs to become the standard in care delivery. The Bipartisan Policy Center’s report on Medicare and Medicaid beneficiaries highlights several policy recommendations to improve care for this high-need population. Revise existing payment models to improve integration of care. Create a new framework for providers to offer health and health-related services to patients. Combine program authority for dually eligible individuals within the Medicare-Medicaid Coordination Office at the Centers for Medicare & Medicaid Services. 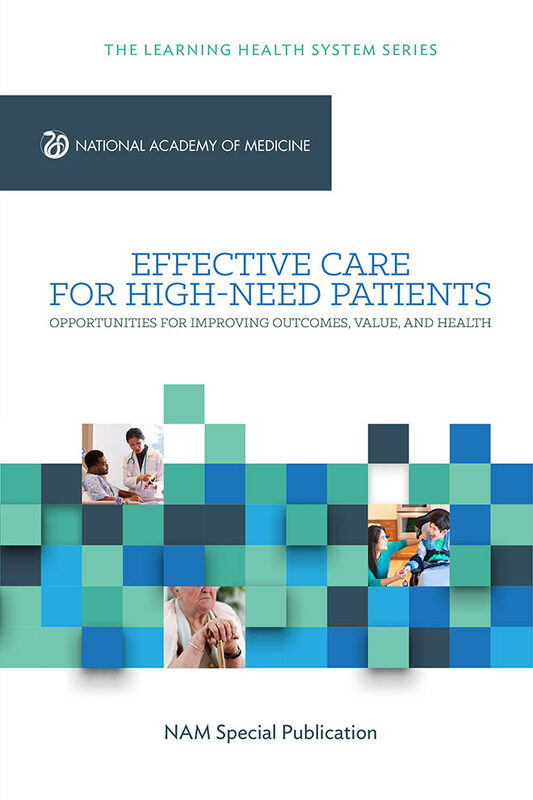 The National Academy of Medicine (NAM) special publication provides a solid foundation from which we, as a field, can engineer solutions that enable health systems and providers to deliver better care for high-need patients. The Peterson Center on Healthcare, its partners and grantees are going deeper to understand what characteristics of proven models hold the most promise for the most patients. 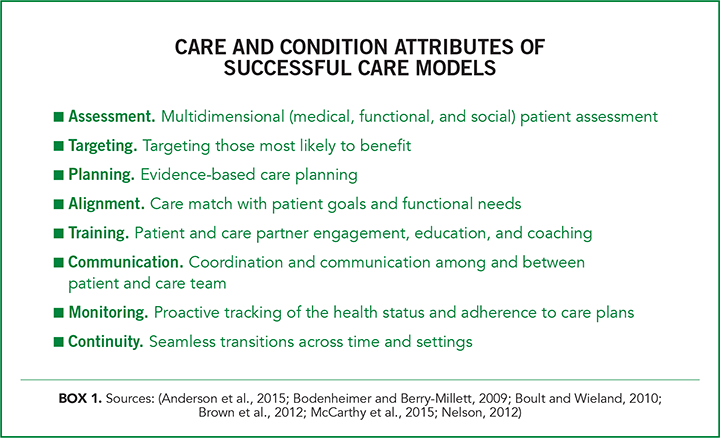 For example, while “care coordination” is often cited as an attribute of high-quality care for patients with complex needs, it can be operationalized in many ways depending on a patient's goals, preferences and circumstances. We need to ask ourselves: coordination by whom, for whom, and in what setting? To address some of these questions, the Center has started a multi-phase project with Stanford University’s Clinical Excellence Research Center (CERC). CERC will work with the Harvard T.H. Chan School of Public Health to analyze claims data from the dually eligible population to identify high-performing care delivery settings for the patient segments identified in the NAM special publication. Researchers will conduct site visits in primary care practices that both provide better quality of care and incur lower annual per capita healthcare spending to extract the features that are believed to drive exemplary performance. This design will allow the researchers to examine attributes of high-value care for high-need populations in the absence of strong payment incentives to improve value. From there, a change package can be prototyped to enable providers to adopt the features into their organizations and local contexts. We also need to understand where there are gaps in our knowledge for certain patient types and bring urgency to finding care delivery innovations that fill those gaps. The Center recently announced new work with Brown University, which aims to identify features of high-performing hospital systems that provide care for high-need Medicare patients. Brown will apply a positive deviance methodology to identify top-ranking hospitals based on quality outcomes and cost as well as the care delivery features that are correlated with high-performance. As with the CERC initiative, a prototype change package can then be developed to address adoption in new contexts. Our collaboration with four other foundations—The Commonwealth Fund, The John A. Hartford Foundation, the Robert Wood Johnson Foundation, and The SCAN Foundation—is helping us align on goals and strategies that can support knowledge transfer and uptake of promising interventions. To maximize the impact of investments in this area and avoid duplication, we are working together to coordinate execution of strategies to spread high-performance healthcare for high-need patients. These strategies include accelerating adoption of high-impact care delivery models, promoting policy and payment reforms, improving measurement and evaluation of these efforts, executing effective communication and partnering on stakeholder engagement strategies. Our first jointly-funded effort, the Better Care Playbook, was developed by the Institute for Healthcare Improvement to help healthcare organizations participating in value-based payment models adopt evidence-based interventions to improve outcomes and lower overall costs of care for high-need individuals. As promising care delivery models are identified, validated and tested, investments are also needed to help create the right environment for the uptake of those models. One dimension of this environment is the policy and incentives context under which patients, families, providers, administrators and system executives operate. We’ve learned from our grantees and partners that adoption of proven care delivery models will depend on high-need individuals being able to access both clinical and non-clinical services with minimal burden. Those who are dually eligible for Medicaid and Medicare often face significant barriers to receiving integrated care because essential benefits are siloed by payers. Improving coordination of these services through an integrated benefit plan was part of a set of recommendations released by the Bipartisan Policy Center (BPC) to address the issue. 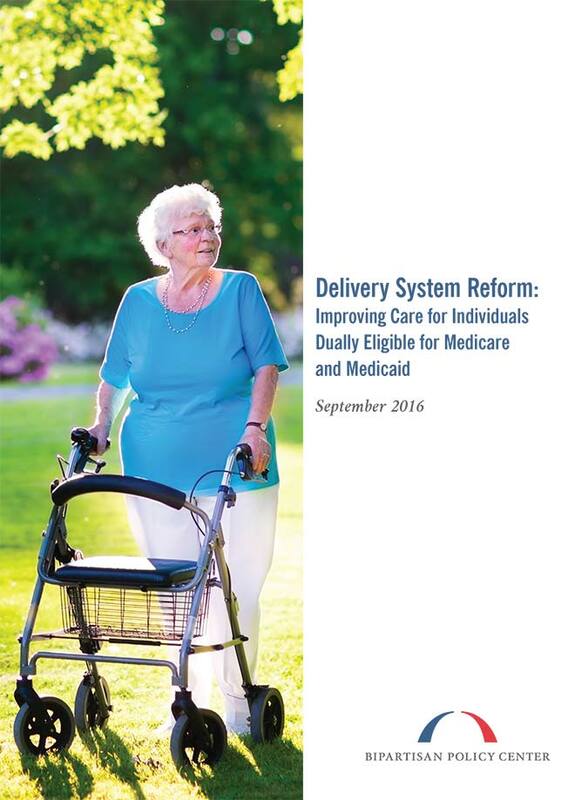 BPC also released recommendations for Medicare to create pathways for MA plans, ACOs, and other providers to better tailor care plans for high-need individuals, especially those who are managing multiple chronic illnesses and frailty. Similar to the duals, the Medicare population will increasingly rely on non-Medicare-covered social supports and, as more models demonstrate how providers coordinate this care, it will be critical for policymakers to support more appropriate benefit structures. In May of 2017, BPC testified before the U.S. Committee on Finance on the BPC recommendations and legislation drafted by the Senate Chronic Care Working Group. Several of BPC’s recommendations were included in the Senate-passed CHRONIC Care Act of 2017. Provisions included changes to permit targeting of services for patients with chronic conditions and permitting supplemental services not otherwise covered under Medicare to be provided to patients with high-cost chronic conditions. The legislation also included provisions similar to BPC recommendations permanently authorizing Medicare Advantage dual eligible special needs plans (D-SNPS), and improved integration of Medicare and Medicaid services provided through those plans. A second and often overlooked dimension of an environment conducive to uptake is implementation capability. Incentives need to meet execution “know-how” to take root and be sustained. The Center is engaging with organizations such as the National Center for Complex Health and Social Needs and the Institute for Healthcare Improvement, which are building hubs for innovators and newcomers alike to share in the "how" of care delivery transformation for high-need individuals. When such hubs are connected to innovative health systems, practice transformation networks and like-minded physician-leaders, it is possible to envision a “scale architecture” for accelerating adoption. Using standardized processes throughout the organization. Our charge to improve outcomes while bringing down costs is not an easy task. We are, however, learning what works, what doesn’t work, and how to share that knowledge such that it can be applied in many delivery settings. We are also working with our foundation partners—via the Better Care Playbook and other tools—to pool our collective expertise and resources. We believe doing so will help us identify gaps, reduce duplication, and accelerate adoption. We are confident that collectively we can deliver better care for all Americans, but especially to those who need it most.